January 9th - Regency Square Library, Jacksonville, FL. January 10th - Pablo Creek Library - Jacksonville, FL. April 2nd - Slidell Public Library - Slidell, LA. April 3rd - Causeway Public Library - Mandeville, LA. April 3rd - South Slidell Library - Slidell, LA. April 4th - COAST Activity Center - Covington, LA. April 4th - Madisonville Public Library - Madisonville, LA. May 16th - Honey Hill Events Ctr. - Osceola, IA. Hello everyone! I am currently planning for my 2019 concert season. - Jeff 11/26/2018. A native of Williamson, New York, Jeff began performing at weddings and cafes while still in his teens. 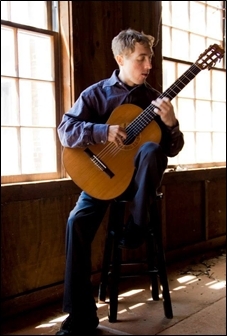 The uniqueness of the classical guitar coupled with his professionalism enabled him to stay working over the years. As his skills grew, he gave full concerts throughout Western New York. His hard work earned him performances at the Rantucci International Guitar Festival as well as the nationally recognized Ithaca Guitar Festival. His concerts continued with his move to Atlanta in the summer of 2002. From 2005-2007 Jeff took a hiatus to tour nationally with Country acts Young Guns (Nashville, TN) and Chace Roberts (St. Paul, Minnesota). As an electric guitarist, Jeff toured much of North America; playing clubs and dance halls with capacity crowds. It was an exciting time in his life and was quite the adventure. On his return home, Jeff resumed his solo performances. By 2009, he was touring throughout Georgia, playing in places such as Savannah, Tybee Island, Toccoa, Richmond, Duluth, and Hartwell. Large, enthusiastic crowds were the norm at these events. These positive reactions together gave him a goal to take his music to a much wider audience. In February of 2010, Jeff undertook his first large scale solo tour. Making stops in Georgia, Mississippi, Louisiana and Texas, he gave concerts for audiences as large as 600 people. The overwhelming success of this tour enabled him to expand his solo career to a national level. Jeff continued his success in 2011 with performances in Kentucky, Tennessee, Georgia, Alabama, South Carolina, Mississippi, Louisiana and Florida. The 2012 - 2013 concert seasons marked a milestone in his career as he expanded his performances to opposite sides of the country. Concerts were given in Idaho, Colorado, Wyoming, Texas, Ohio and most of the South East. Over the course of his 2014 -2018 performing seasons, Jeff continued to build upon the momentum of the previous years. He performed to many “standing room only” audiences around the country as well as sold out performances in Georgia and Alabama. Jeff studied at the State University of New York at Fredonia under James Piorkowski. He currently lives in Lanier Harbor (Buford, Georgia) where his time is devoted solely to his music. Copyright (c) 2017. Jeff Bianchi. Photo by Jakim Noske. All rights reserved.